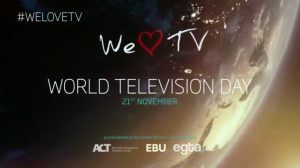 The European Broadcasting Union (EBU), the Association of Commercial Television in Europe (ACT) and egta, the Brussels based association of television and radio sales houses are underlining the impact and reach of the television industry on the occasion of the 20th anniversary of World Television Day (21 November). As part of the annual United Nations initiative the three organisations have produced a 30 second video emphasising the impact TV has on European society. It will be shown by broadcasters across Europe, Asia, Canada, USA and Australia on 21 November (please see here: http://bit.ly/WorldTVDayVideo2016). The video highlights that 600,000 people in Europe help create the TV programmes that reach 610 million viewers across the continent. Viewers, who watch for an average of 3.55 hours every day, enjoy 60,000 hours of entertainment daily on Europe’s 5,463 TV channels. “These broadcasters play an indispensable role in the functioning of democracies and contribute to the cohesion of society. Despite the many choices consumers now have television remains the dominant medium with more and more of us watching across all platforms,” she added.